Quinoa is trending right now. I personally love this heart-healthy whole grain. It is high in protein and is gluten-free. Plus, its mild taste and rich texture make it perfect for different kinds of dishes. The quinoa absorbs flavors really well. It is great for a side dish or make it into a main dish like this one. It is also great served under a piece of grilled chicken or smoked salmon. You can substitute quinoa anytime you would use brown rice. If you don’t have (or like) quinoa, you could substitute orzo pasta, brown rice or couscous. If you want to make this recipe vegan, just omit the cheese. Spread the vegetables evenly on sheet pan, drizzle with olive oil and sprinkle with salt.. Place in the oven. Roast, tossing occasionally, until they are soft and are beginning to turn brown around the edges, approximately 20-25 minutes. Remove from the oven and cool completely. While the veggies are roasting, In a medium saucepan, bring the vegetable stock to a boil over medium-high heat. Add the quinoa, bring to a boil. Cover, reduce heat, and simmer 20 minutes or until liquid is absorbed. Remove from heat; fluff with a fork. Stir in the roasted veggies, sundried tomatoes & cheese. Slice the tops off the peppers and remove all ribs and seeds. 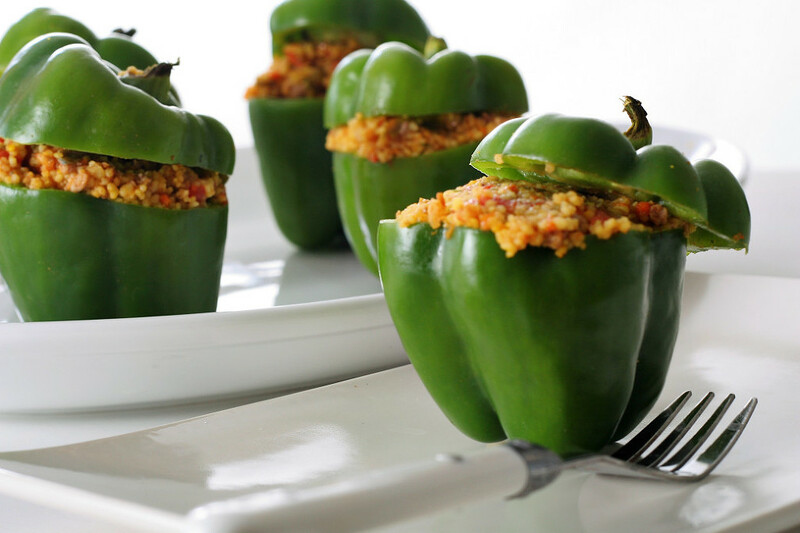 Place the peppers in the baking dish Spoon the quinoa mixture into the peppers. Cover the dish with foil and bake for 45 minutes. Remove the foil, sprinkle the top of each pepper with cheese and continue baking until the cheese is golden, about 15 minutes. While quinoa is usually considered to be a whole grain, it is actually a seed, but can be prepared like whole grains such as rice or barley. Try aquinoa pilaf salad recipe, or serve a vegetable stir-fry over cooked quinoa instead of rice. Quinoa is my favorite whole grain for three reasons: First, it takes less time to cook than other whole grains – just 10 to 15 minutes. Second, quinoa tastes great on its own, unlike other grains such as millet or teff. Add a bit of olive oil, sea salt and lemon juice and – yum! Finally, of all the whole grains, quinoa has the highest protein content, so it’s perfect for vegetarians and vegans. Quinoa provides all 9 essential amino acids, making it a complete protein. Quinoa is a gluten-free and cholesterol-free whole grain, is kosher for Passover, and is almost always organic. Prepare quinoa as you would prepare rice. Cover it with water or vegetable broth and boil until soft, about 15 minutes. Or, place 1 part quinoa to 2 parts water in your rice cooker. Did you know quinoa also makes a great hot breakfast cereal, similar to oatmeal? According to CalorieCount, 1/3 cup of cooked quinoa has 160 calories, 2.5 grams of fat, 3 grams of fiber and 6 grams of protein. For more about the nutritional value and why quinoa is such a great addition to your diet see here: bulk bins or the baking aisle of natural foods stores, or find it online. More and more grocers are stocking quinoa these days. Check the ethnic foods aisle (sometimes it’s next to the couscous and barley) or you might find it near the rice and pasta.